Wine production in Iowa has leveled off according to a report by Iowa State University (ISU). After growing rapidly since 2000, the amount of native wine sold in Iowa declined slightly from the previous year according to the report. During 2012, total sales of Iowa wine were just over 264,000 gallons compared with 265,000 gallons during 2011. Craig Tordsen, the author of the report, said that a new 2012 law that allows convenience stores to sell wine might have contributed to an increase of non native wine sales at the expense of local wineries. The consumption of Iowa wine as a percentage of total wine consumption in the state has plateaued at 6% since 2010. Tordsen also said that the rapid expansion in the number of wineries in Iowa has slowed. According to drinklocalwine.com, there were 13 wineries in Iowa during 2000 compared with 101 now. However, the number of wineries in the state increased by only two during 2012. Last year, Cedar Ridge hired Glazer’s, a Dallas based distributor, to help the winery sell to retailers outside of Johnson and Linn counties. 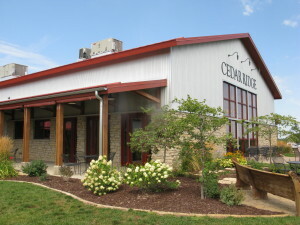 Cedar Ridge is one of the few wineries in Iowa to use a distributor. According to the ISU report, only 2.7% of the wine produced in Iowa is sold through a licensed wholesaler. Wineries in Iowa can self distribute regardless of size.